Bumbags, fanny packs, money belt, belt bag, whatever you want to call them, the laughable ’80’s accessory is officially back and I know what you’re thinking; how could something with such an embarrassing name ever make a serious come-back in the modern fashion world? Well, in a world so fickle as fashion, and with a little help from Armani and McCartney on the catwalks, a-listers Kendall Jenner and Miley Cyrus rocking serious street style, and a hoard of pioneering festival go-oers at Glastonbury; 2017 is the year of the bumbag. Once associated with paranoid tourists and Mr Motivator, the time has come for us modern trendsetters to take back this totally cute and totally practical accessory trend from the grasps of the holidaying dad sporting a DiCaprio curtain fringe. The bumbag brings with it many practicalities as its small size means you have no option but to limit your necessities to a minimum meaning no un-needed haulage to cart around. It also acts as somewhat of a lifesaver if worn right, keep to your front and all your valuables stay right where you can see them, practically eliminating the chance of pesky pick-pockets getting your goods. And finally, you can roam hands free; literally. Making shopping, festival raves and photo opportunities a whole lot easier. We’ve called on our stylist to present you with 3 different ways-to-wear that will make you want to give this retro classic a second chance. And don’t worry, if anyone asks, you don’t even have to call it a bumbag anymore. This year’s chic contemporary updates have called for sophisticated names like the ‘waist clutch’ or ‘belt bag’ (if that makes you feel better about wearing it). 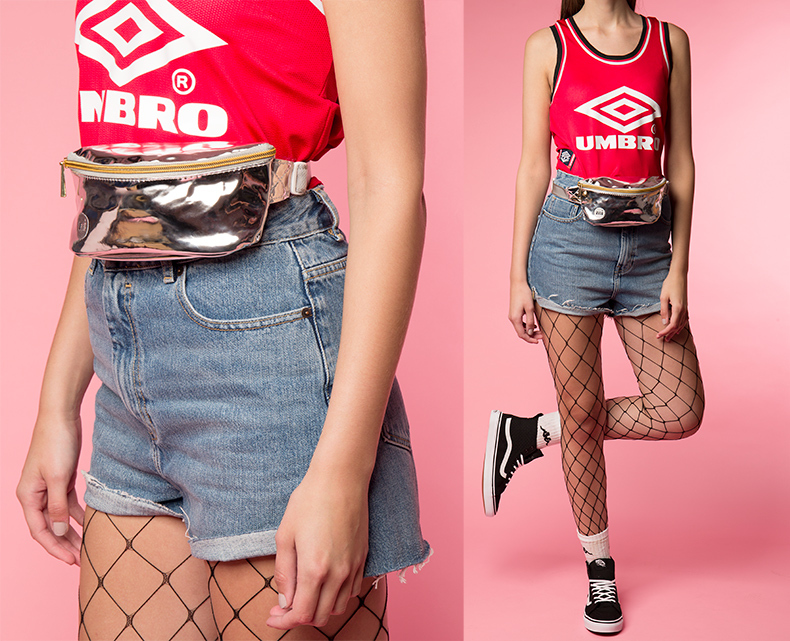 This metallic silver Mi Pac bumbag is not so far from the colour blocked waterproof profile you may have sported as a child but it definitely boasts some serious sass to take your festival look to the next level. Pair it with some denim shorts and a retro sports top and boom – Nostalgia at its finest. Cinch a flat bum-bag underneath a oversized coat for the colder months and keep your look sleek and sophisticated. 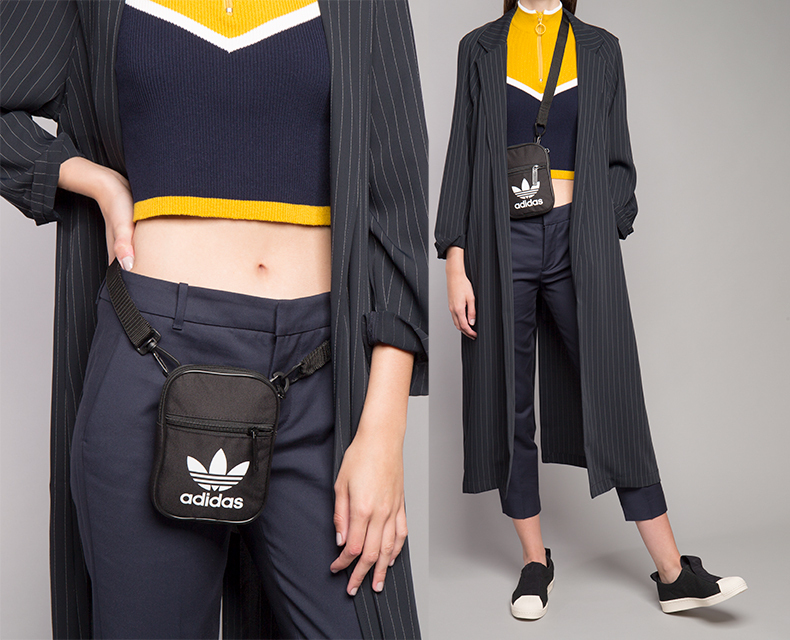 Adding that casual flair to a smart look, this adidas bag may be small but it packs a fashion punch and will keep you cruising around the city in serious off-duty style. This faux-leather Mi Pac profile looks more chic then geek with a rose gold metallic finish keeping it bang on trend. Wear it over the shoulder for that added bit of class or keep it real and wear it peeking out from a little co-ordinated number as the main attraction. Instant style points! So that’s it, the dark days of awkward, nerdy bumbag wearing are over and it’s time for us all to stop living a lie; we totally want one. Be bold with your bumbag and experiment with your style; after all, it’s probably the most controversial thing you will ever sport. So if we’ve managed to convince you with our slick styling practices to make your bumbag look cool, then what are you waiting for, get yours now!